Raised in the United States, Mark (Ma Dong-seok, from “Train to Busan”) is invited to return to a special arm-wrestling competition in his native South Korea. 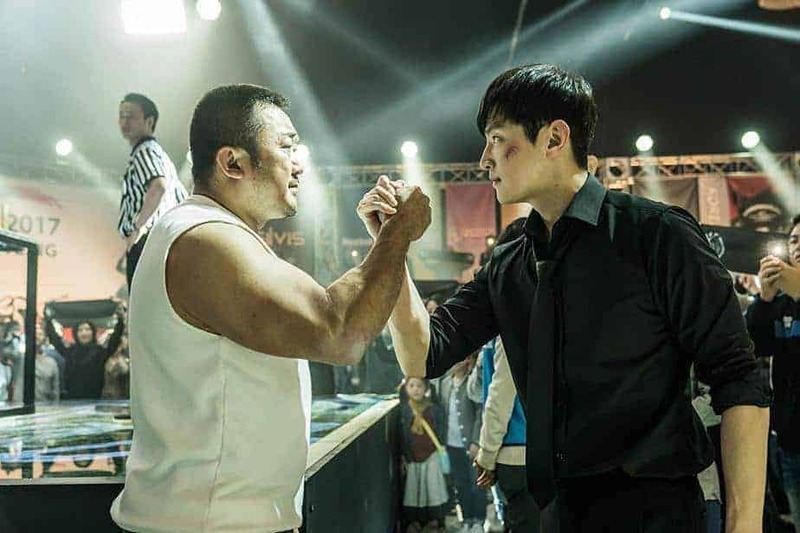 Hoping to use the opportunity in order to return to his past glories on the arm-wrestling circuit, he reunites with his friend Ki-jin (Yul Kwon, from “The Admiral”) who offers to help get him ready for the competition. While in the midst of his routine, he suddenly meets Jin-soo (Han Ye-ri, from “Sea Fog”), who turns out to be his long-lost half-sister before he became adopted. As he finds balancing his training for the tournament impeding the time he spends with his new-found family, he must make a decision one way or the other that affects his chances at winning. Right off the bat, one aspect of “Champion” needs mentioning. The film’s storyline is going to be readily familiar to most American audiences as this will evoke memories of the Sylvester Stallone vehicle “Over the Top.” The focus on arm-wrestling is definitely a spot that’s tough to pass over, not only because of the direct mention as the source of his interest in the sport, but with the similarity in spirit. Both films contain a man encountering unexpected family bonds while out on the road training for arm-wrestling competitions. The main difference between the films is that the American version goes for cheesy, over-the-top action-packed arm-wrestling competitions set to the sounds of energetic pop-culture ready music, while the South Korean entry opts for heartstring-tugging melodrama as best they can. Aside from the overfamiliarity, “Champion” has plenty of elements going for it. Most of this is due to Dong-seok’s incredible turn as Mark, a lovable kind-hearted oaf of a man in the best sense. Gullible to a fault, loyal to the end and always willing to help his friend, he is the perfect lead in this type of story. While the early scenes of him returning to Korea offer some fish-out-of-water comedy stylings, the film goes for the heart as this story becomes a background piece on how he bonds with the family he never knew he had. The scenes of him with the two kids who look up to him as this strange mountain of a man who’s now living with them and helping to raise them as a surrogate father figure, are quite warm and affecting. As well, the comedy from the kids getting used to him being around and defending him to others is a nice contrast as well. Being honest, the film works far better at that part of the story than the arm-wrestling. Writer/director Kim Yong-wan is somewhat out of his element with the exploits of the competition, which is handled with nothing but the usual cliches and sports moments. From going through the early rounds where he gets the itch to join in on the sport again, to the usual means of sneaking preparational training montages with unconventional objects, there’s plenty of these traditional setups featured throughout here. Even the introduction of the fearsome opponent who maims his challengers, that’s strategically positioned as an obstacle to overcome during the competition, is included here. This scenario feels ripped off from every other genre fable, leaving one in no doubt about what’s going to occur in the finale. 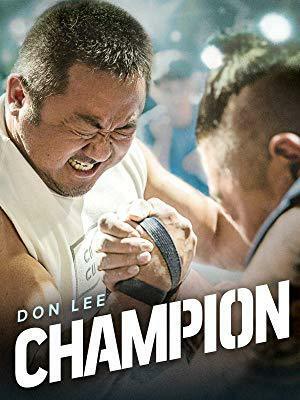 While the outcome is in no doubt, “Champion” still entertains with a riveting series of arm-wrestling battles so it’s still engaging, but only because it piles on the tropes as it does. Overall, the film is quite enjoyable and certainly contains enough likable elements to really get a lot out of it. The cliches and expected setups may still be present here like they are in most sports movies of this ilk, but the family drama that emerges is a far more engaging backdrop anyway, leaving this with a triumphant feeling for those that enjoy these kinds of efforts.